Check-in to lavish Mirage Whitsundays for 5-star service, warm climate year-round, prime location and stylish accommodation. 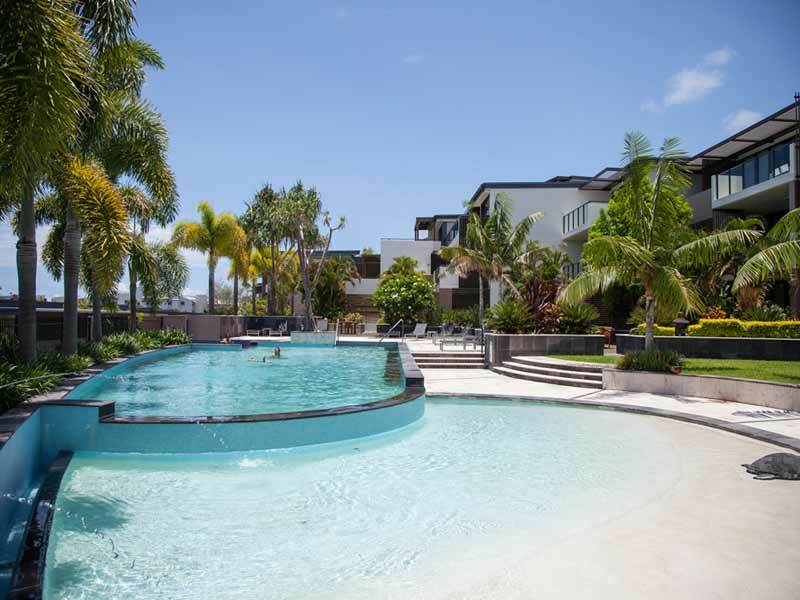 The resort is ideally located in the centre of stunning Airlie Beach, Queensland – world-renowned for pristine, crystal-clear waters, epic nightlife and a supreme base from which to explore the famed Great Barrier Reef. 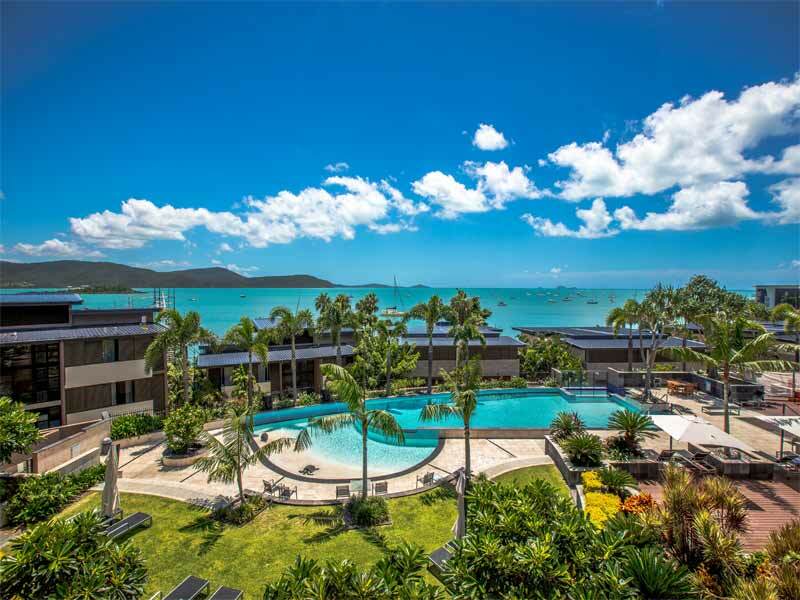 Flaunting modern décor, the convenience of self-contained living facilities, unparalleled ocean vistas and a myriad of things to do in and around the resort, Mirage Whitsundays is the best destination for a tropical getaway. 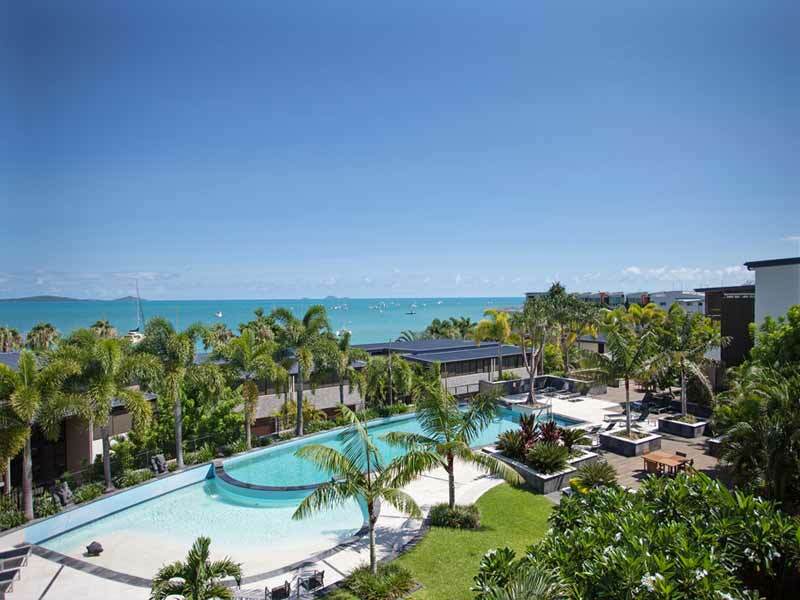 Favoured among couples, families and friends, Mirage Whitsundays caters to the adventure-lovers and relaxation-seekers alike. 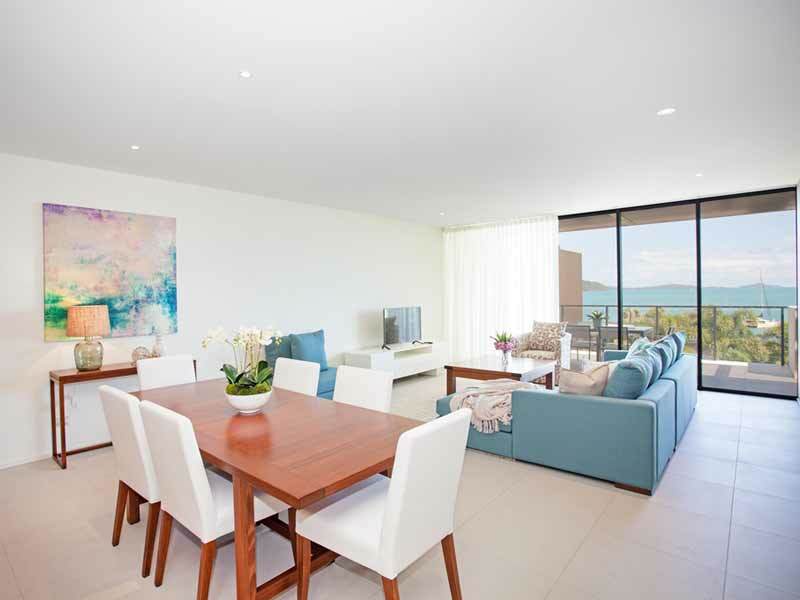 Positioned on the striking Whitsundays coastline, guests have endless activities to choose from. Get up-close-and-personal with captivating sea life as you snorkel or dive your way through the Great Barrier Reef (the largest living reef bank on the planet! ), meander along the elaborate stretches of Whitehaven beach’s pristine white sand, aboard a helicopter, yacht, jet ski or kayak and hop between the hundreds of islands dotted off the mainland. 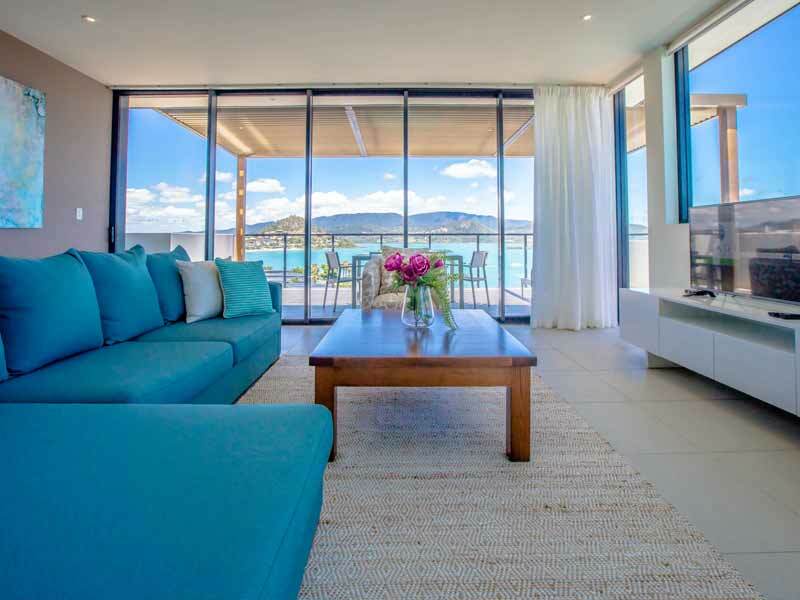 Whatever you want out of your holiday, Mirage Whitsundays is sure to deliver. 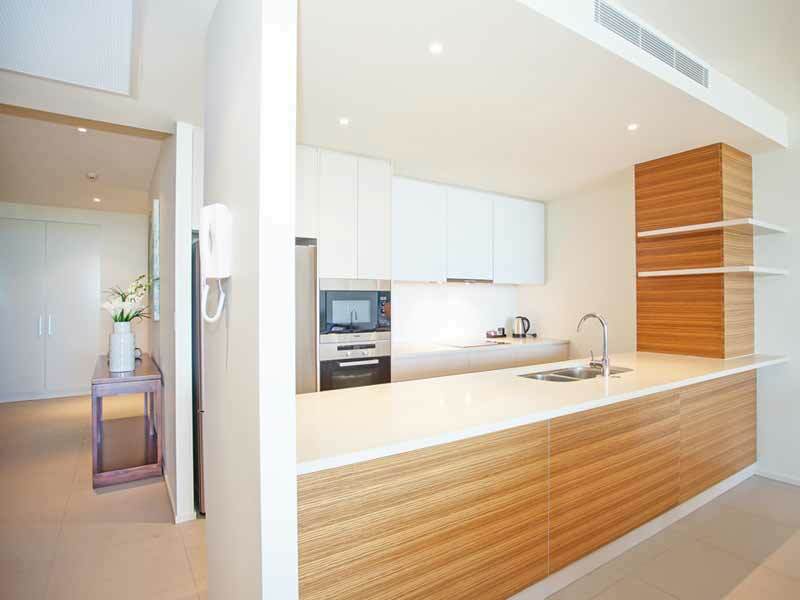 The apartments at Mirage Whitsundays are carefully designed to ensure guests have access to all they need – a home away from home. Fully-equipped and self-contained, these rooms bring the outside in with ample natural light and commanding views of the vast Pacific Ocean and tropical surroundings. 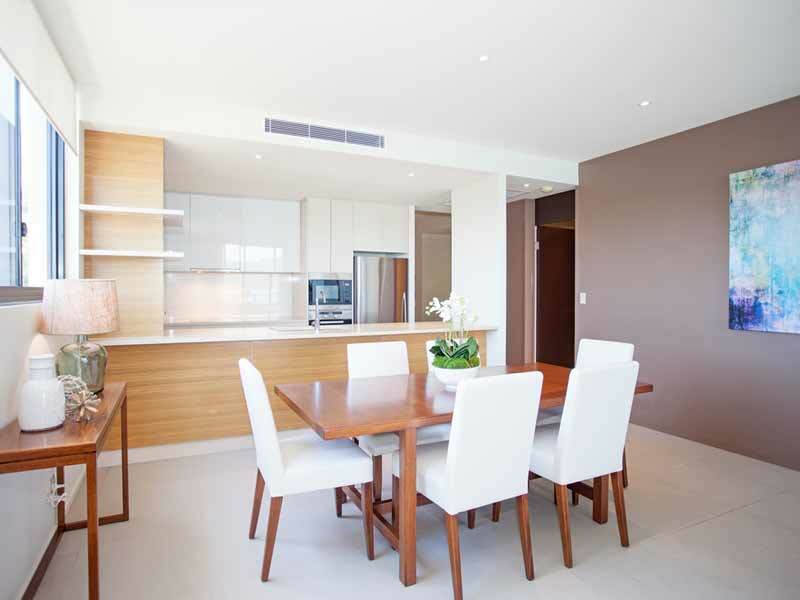 Each apartment boasts a spacious lounge room, private balcony or terrace, 2 bathrooms, a contemporary kitchen and study area. For your comfort, you will have access to a flat-screen TV, air-conditioning, high-speed Wi-Fi and much more! Should guests manage to leave the comfort of their own private haven, there is much to see and do around the resort! Start your day right at the advanced wellness centre featuring motivating views of the resort’s pool and greenery. When hunger strikes, grab a table at the on-site restaurant with exquisite, modern cuisine options for all tastebuds (opening Winter 2018). 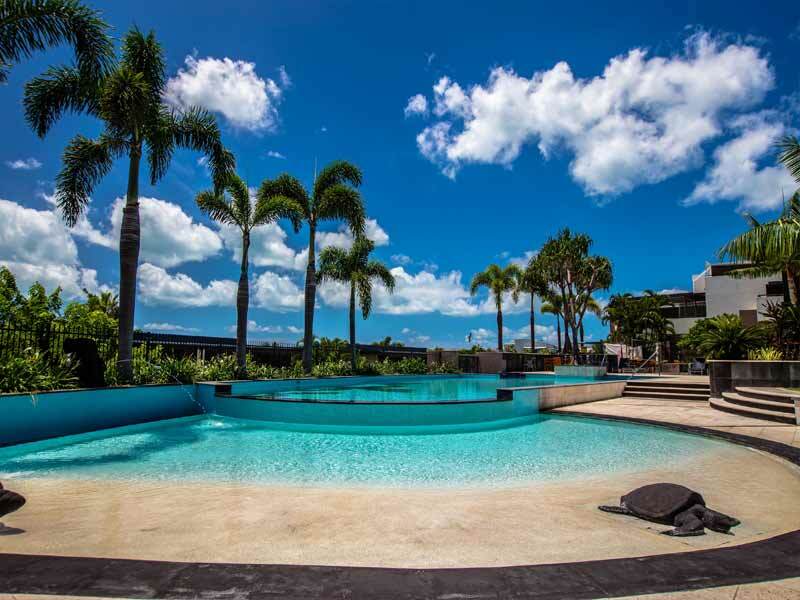 Later, soak up some much-needed rays by the sprawling lagoon pool or horizonal pool, or revitalise the body with the terrific spa treatments on offer. Why go to Mirage Whitsundays? 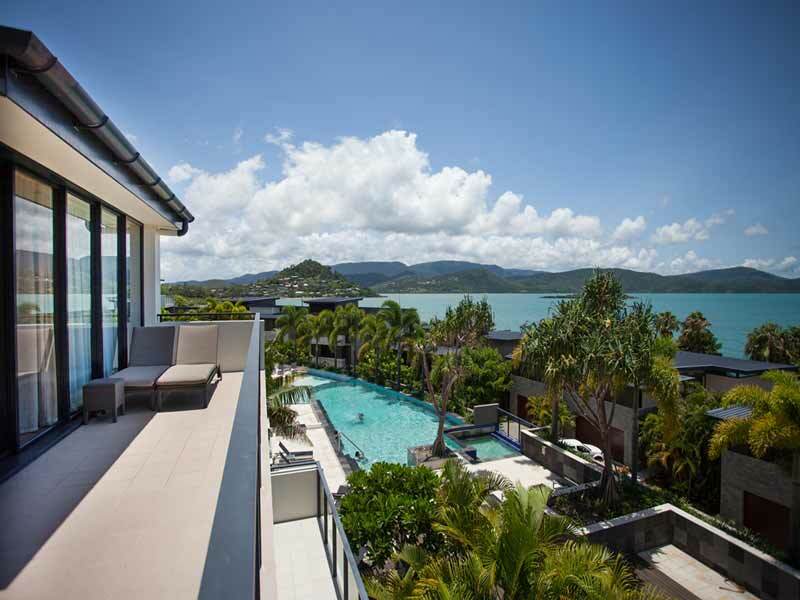 Enjoy the perfect balance between adventure and R&R at Mirage Whitsundays. If its close proximity to natural wonder Great Barrier Reef isn’t enough, Mirage Whitsundays offers a never-ending list of priceless experiences to guests. 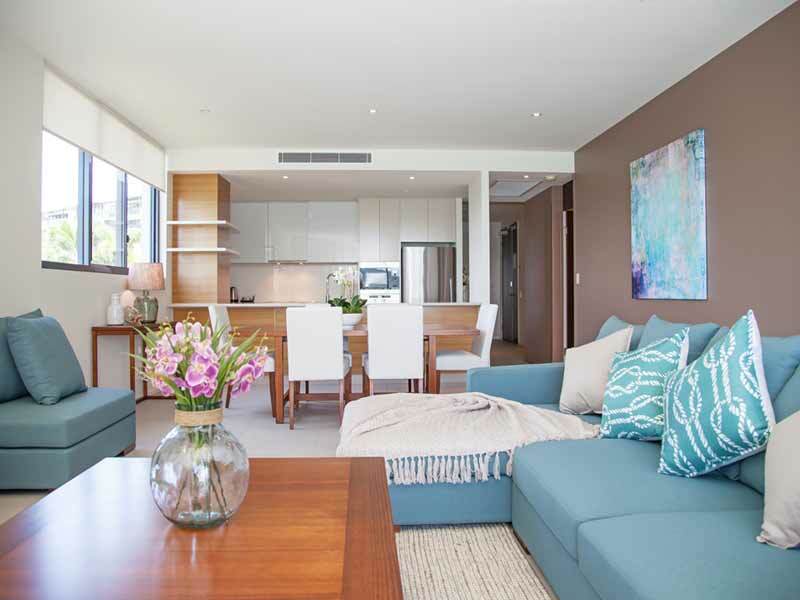 Wake daily to magnificent views of the Pacific Ocean, the spectacular Tropical North Queensland flora or tranquil vistas of the resort’s grounds from your fully self-contained apartment. You’ll have access to all of the 5-star amenities such as fashionable décor, a secluded balcony and a spacious layout for your ease. Treat yourself with on-site spa services, superb dining and some quality chill time at either of the 2 expansive pools. Explore all this destination has on display outside resort walls such as snorkeling, diving, bar hopping, helicopter rides and rainforest trails! 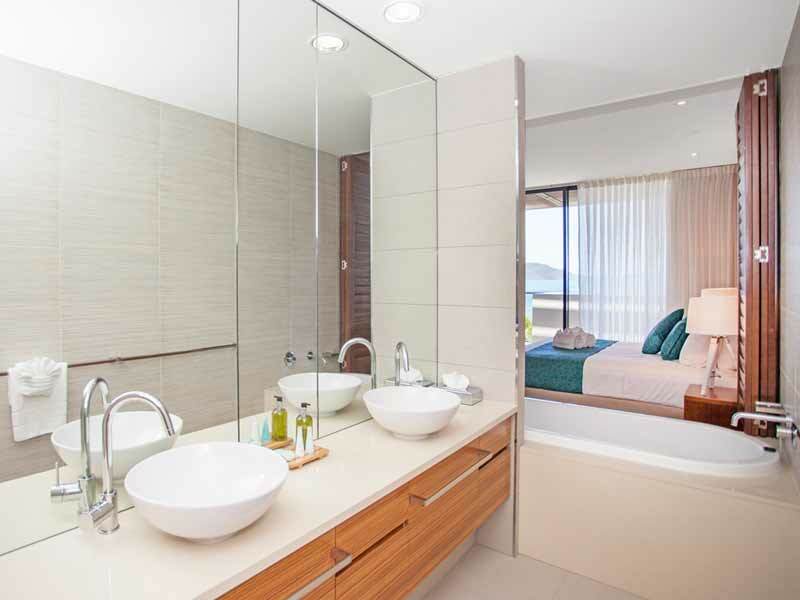 Book a 1 Bedroom Apartment at Mirage Whitsundays for ultimate comfort and luxury. Sip complimentary tea and coffee from your expansive terrace overlooking the glittering ocean or recline in your spacious living room under the air-conditioning. Enjoy contemporary décor, a deep soaking bathtub, a fully-equipped kitchen, marbled bathroom, flat-screen TV, working desk, plush bedding, self-contained laundry and more! 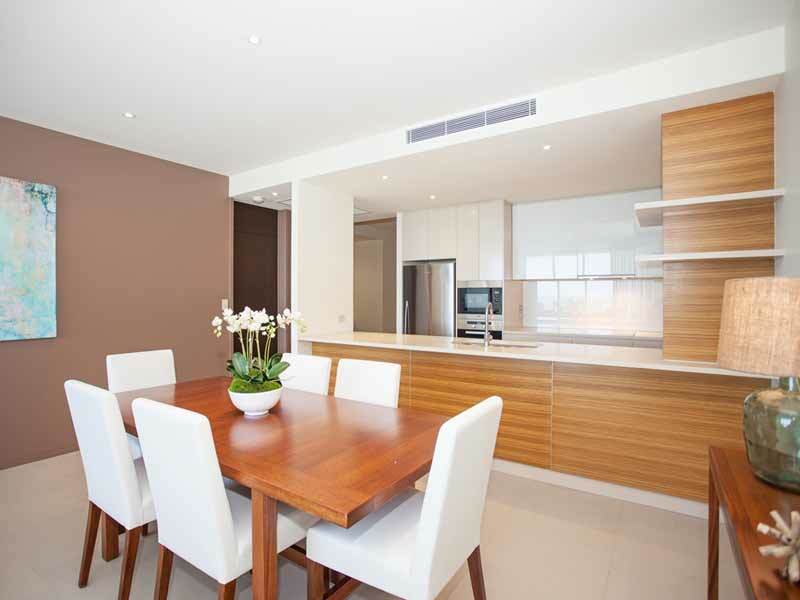 This apartment is spread across a generous 205sq. metres. 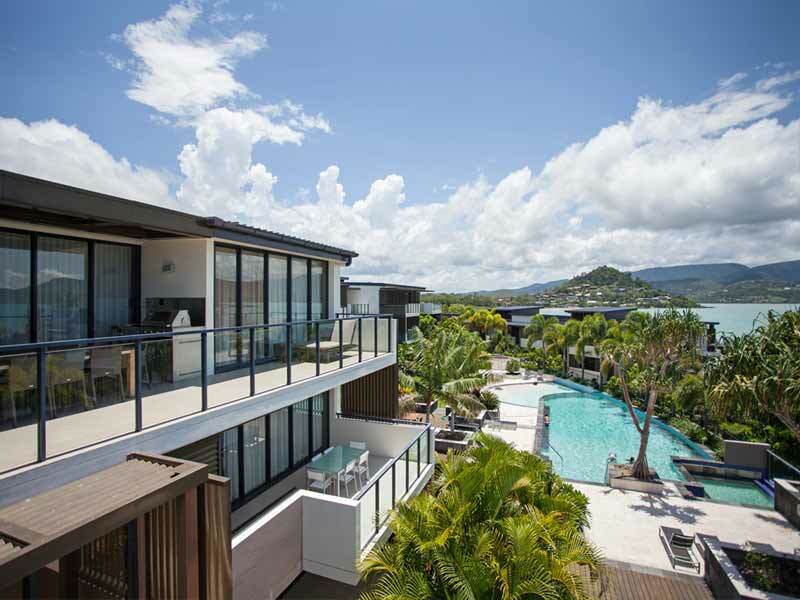 Mirage Whitsundays holds a leading position on the waterfront of Queensland’s stunning Airlie Beach. The closest airport hubs are Hamilton Island and Whitsunday Coast Airport however guests are required to take a picturesque 60-minute ferry ride (running hourly) should they fly into Hamilton Island. 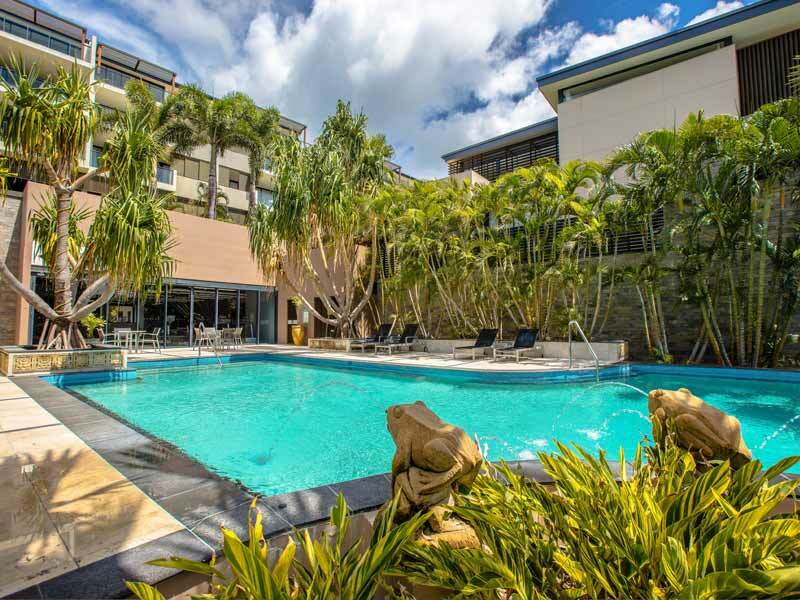 The resort is nestled between the lush rainforest, bars and restaurants, boutique shopping and, of course, the grand Great Barrier Reef – making it the perfect coastal getaway destination. 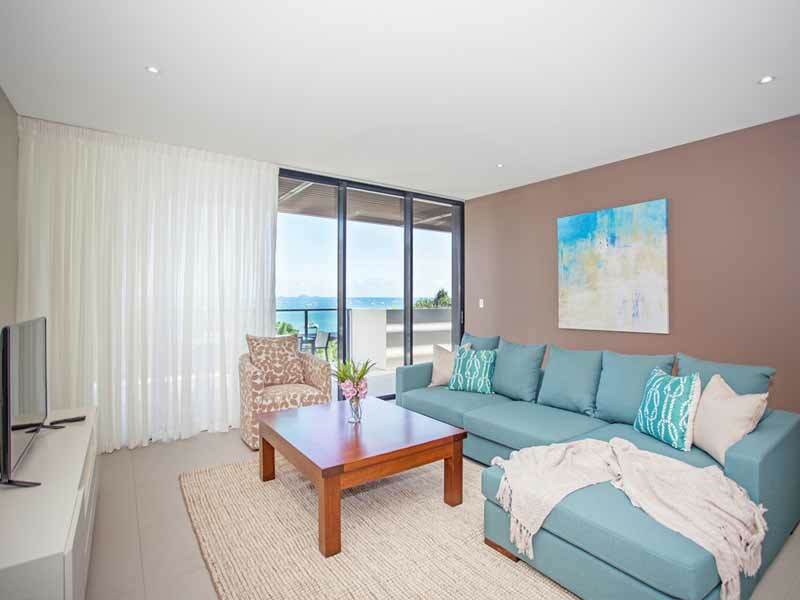 Guests of Mirage Whitsundays will never be stuck for things to do whether in the apartment, around the resort or in the area. When (or if) you grow weary of basking in unrivalled sea views from your private balcony or indulging in movies on your in-room flat-screen under the temperature-controlled air-conditioning, stroll on down to one of the 2 glistening pools complete with chic sunlounges. Get your sweat on at the epic wellness centre, relish contemporary flavours at the brand-new restaurant or unwind with a generous selection of day spa services. Later, step beyond the resort’s bounds and explore everything the region flaunts. Snorkel or dive as you befriend the majestic sea life at the Great Barrier Reef, helicopter between untouched islands, kayak across transparent lagoons, pay a visit to Dingo Beach for a thrilling wildlife experience or hike through Cedar Creek Falls. 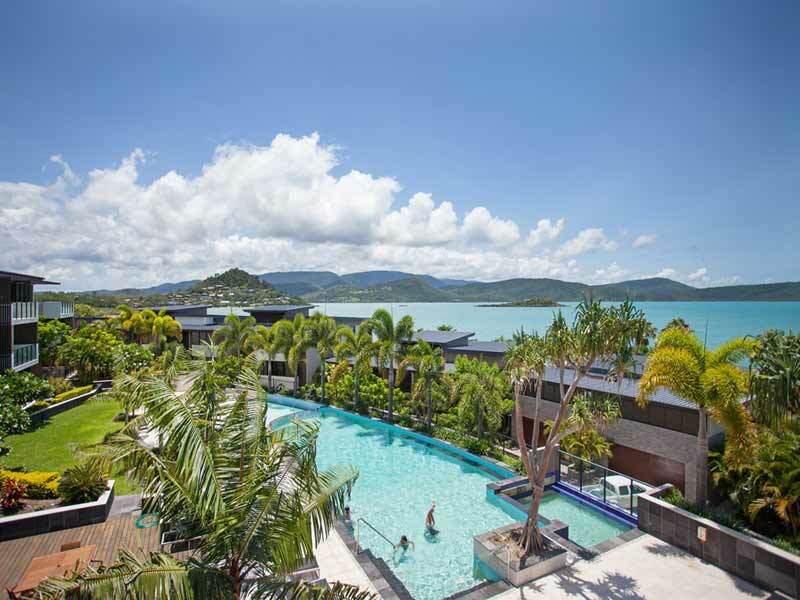 The world is your tropical oyster at Mirage Whitsundays! Fantastic resort. Everything was fabulous from the superb views from the balcony to the self-contained apartment which was well-stocked with everything you need for your stay. Staff were helpful and friendly and the walk to the marina was tranquil and pleasant. The resort was serene with no noise (except the exotic wildlife) and the facilities (pool and gym) were well-maintained. Cannot complain – loved it!